Today was a day I just wanted to soak in a bit. To sit back and watch my students, but not rush. Yet, it was the last day of PARCC testing. My students needed to come in from the playground, do lunch count, attendance, and be ready to head down to begin the tests within five minutes. But man alive, those first five minutes were glorious. I've never required my students to be quiet when they come in at the start of the day. It feels unnatural. They come in from the recess and move about the room, getting ready to begin. We have lunch count at the Promethean board, kids running to the restroom, dropping off lunch money, etc. Often I will have kids come up and talk to me about what they read the night before and have a quick conference about what they read that day. Today that was still true, but it was also more. I gave two of my boys new books I thought they'd enjoy before they left school on Wednesday. One came up to me this morning to tell me why he thought it packed an emotional punch. He had read more overnight in that book than any other night of the year so far. He's a tough customer, so I was thrilled. The other boy I had given the first book in the Maximum Ride series. He was concerned that it was a "girl book", which I assured him was not the case, that books don't have gender. To further make my case, I listed four boys in football and basketball that I knew he knew. They were big fans of the series in previous years. This morning he not only came in to tell me he loved it, but a few minutes later I saw him in a deep conversation with three classmates about the series as they asked him what part he was at and what he thought so far. As I sat back and watched the morning rush unfold, I saw little conversations happening all over the room. Every single conversation was about reading. No exaggeration...Every. Single. One. It actually took my breath away. An hour later I sat in the room giving them their last PARCC test. As kids finished, they would quickly grab their book to read. Several curled around it, getting as comfortable as possible at the tables. I watched pages flip, graphic novel panels studied. I looked at Rose, a ticking time bomb as she approached the end of One for the Murphys. I looked over at my two boys from the day before, devouring their new books, one looking at me and giving me a thumbs up. With nineteen days left in the school year, there are certainly items I haven't gotten to, things that will be left untaught. Watching my kids today, though, I know we got this part right. Our classroom is alive with the power of story. Let me begin with A Fire Truck Named Red. This one came in the mail from a publisher. When I first saw it I figured I'd read it and then give it to my niece, Vivian. Moving to seventh grade next year is making me analyze every book as I contemplate bringing each to a new classroom. Upon reading it, however, I changed my mind. In talking to his grandpa and hearing stories about when he was little, a boy grows closer to him and sees the gift of the fire truck in a new light. I decided that this must come with me to my new classroom. The seventh graders have to interview someone in their family over a certain age every year and write up a paper describing that relative. I think this picture book will be a great example of how this assignment can be beneficial to my new students. Moving on to another great ARC, Some Writer! : The Story of E.B. White by Melissa Sweet. I know Sweet for her amazing work in picture books, but here she branches out. This biography is much longer, around 180 pages if I remember correctly. Sweet has done amazing research here to share what a remarkable man White was. I cannot wait to have students read this and discover the author for themselves. And of course, since Sweet is the author here, the illustrations that go along with the text are amazing. I cannot wait to buy a hardcopy of this one. 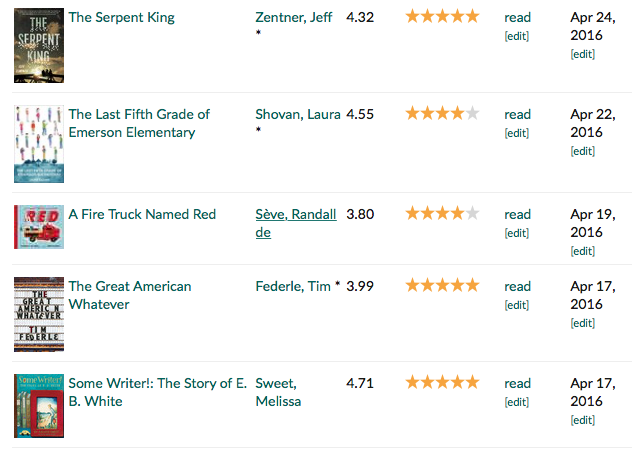 The Last Fifth Grade of Emerson Elementary by Shovan I purchased after Donalyn Miller reviewed it on Nerdy Book Club. (HERE) I have to say, I teared up a bit thinking about how this was my last year in fifth grade too. At first I was worried I wouldn't be able to keep track of each character. (There are 18 students and each poem is from the point of view of a different one. Then they repeat.) They poems do a great job clearly sharing the voice of each child. Tim Federle could write up detailing the weather each day for a month and I'd buy it. His Nate books were brilliant. So when I heard that he wrote a YA book, I was rather impatient to read it, as you can see from my Facebook status below. Federle did not disappoint. Brilliant. And finally, The Serpent King. Sigh. It's now been three hours since I finished this book and I'm still in mourning. I don't want to be done. I want to begin rereading it immediately, but I have too many books I need to get to. A friend said it's on sale this week through Kindle, I highly recommend you get it now. Amazing, amazing, amazing. I think it would be great for 8th on up. Not sure if I'll hand it off to 7th graders or not. This book was so good I had to blog about it immediately, and cried as I wrote the blog. (HERE). The book is that powerful. Read it. That's all I can say. Read it. About thirty minutes ago I closed the book I had just finished. 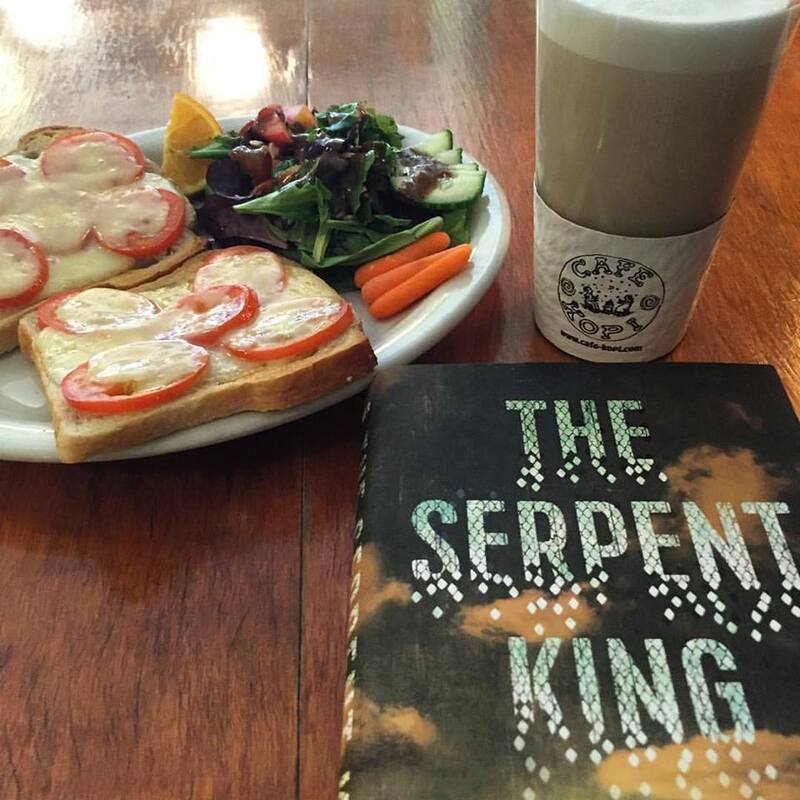 It was The Serpent King by Jeff Zentner. This is a YA book that I am discussing at my book club tomorrow night. I've moved around my house like a bit of a zombie for the past half hour, putting potatoes on the grill, checking to see what Luke was doing upstairs (reading), talking to my dog. Nothing could pull my mind from where it was, inhabiting the tiny rural Tennessee town with Travis, Lydia, and Dill. This book takes your heart and twists it, letting go at regular intervals so that you think you've caught your breath, only to lose it again. Here we meet this trio at the start of their senior year in high school. Lydia's future is already planned - her fashion blog has her set on a life in New York City, and she will be shedding this small town, and her two friends, to get there. Travis will be staying in their town, working in the lumber yard, but living in the fantasy world in his head, based on the Bloodfall book series he so loves. Then there is Dill. The son of a fallen preacher, who worked with snakes, and currently resides in a Nashville prison. These three friends are looking down the tunnel of senior year, some with excitement to get through, some with dread for what's to come. There were so many moments that I found myself laughing on one page only to turn it and gasp with horror on another. Turning the page again I would find myself wiping away tears. This book is good. So good. When my son asked for a potato with his dinner tonight I looked up, grateful that no one in my house was phased by the tears working their way down my face as I read. This is normal, this falling into a book. And it is in my classroom as well. The only thing I enjoy about PARCC testing week at school is that my students and I get extra time to read. Friday afternoon found us in various parts of the classroom, devouring pages. I was working with a student at a table in the front of the room when I heard a gasp. I looked up and locked eyes with Payton. She's reading Maximum Ride Forever by James Patterson, the last book in the series. I had read it the weekend before. She mouthed a character's name at me and I nodded my head, knowing exactly what part she was at. She made a little moan and buried her head on her arms, shoulders shaking. My student at the front was still reading from a book for me, so I quietly stood up, grabbed the Kleenex box from the shelf behind me, looked over as Josie stood up, tossed the box to her, and she brought it to Payton, hand on her shoulder. The other students looked over, murmured words to Payton, some putting The Maximum Ride series on their to read lists, and went back to their books. There are many reasons I want my students to be readers, but this is a huge part. I want them to feel the grief you have for the characters you love. How you can live so many lives through them. How you can care about characters so much in tears your heart in two. How you can finish a book and not want to start another one because what can possibly measure up. How you can love books and stories so much, they become part of you. I want this for them. 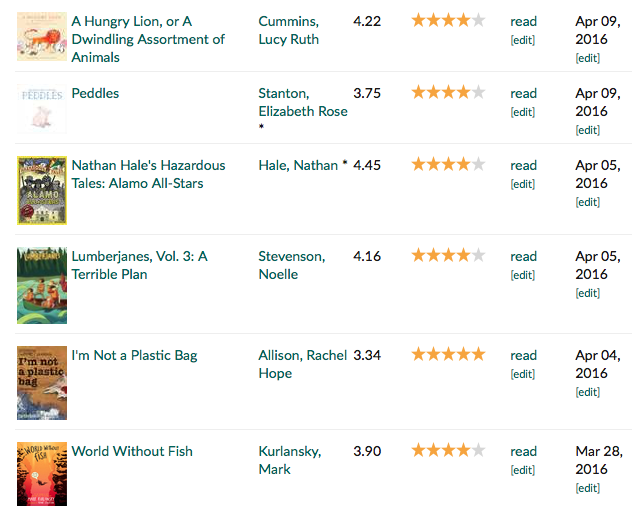 As for me, I'm left wondering what on earth I will read next. And The Serpent King? It's off to one of my former students tomorrow. Others need to read this. It's that good. I try to teach my students the benefit of reading and writing. How reading can make them feel less alone, connect them to people they have never met. That books can make them better people, more empathetic, and more self-aware. I tell them the same thing about writing. That I want them to find the joy, the desire to write. That writing is something to turn to when you are trying to make sense of the world, of other people, of yourself. We turn to our notebooks to scribble our feelings, the good stories, the heart ache. My fifth graders have lived a lifetime in their decade on this earth. Some have experienced far more than I would ever wish on them. They need to find the catharsis of putting a pen to the page. All of this came back to me this afternoon. It was a great day at school. I had the joy of writing and sharing my writing with my class. We had a ton of time to read and shared the stories we were devouring. A consultant taught a lesson for our staff in my room and I had the chance to see my students with fresh eyes. My heart was full to bursting with pride in them. I ended the school day sitting with a colleague, talking about plans for next year, excitement overflowing. No oven to make it in. A essay test to craft. And a classroom to pack and move. Thirty days into this remodel and I felt my anxiety on high. There is simply too much to do and my life is too unorganized for my brain to work. With track meets keeping us out late each week, homework for my college classes, and more and more and more on my plate, I lost it. I sat in the parking lot, tears spilling over, and wondered how on earth I could get it all done. And the reality is, I can't. I need to cut back, I always do, but it's hard to say no. Too many part time jobs, too many things I want to be part of. So, it's one day at a time. I came home to more chaos, more frustration upon learning that I had purchased the wrong fixture after all of that time, but it will be ok. My mom offered up some help. My husband assures me that the fixture will work anyway. And I worked my way over to the keyboard, knowing that the only thing that would really make it all ok was to write. The lessons that I teach my students find their way back to me all the time. It's time to listen to my own advice. I must write. My reading life has been hit or miss lately, not in the wonderful books I get to devour, but in regard to the time I actually have to read them. 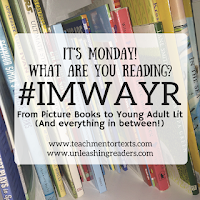 I've read some terrific books lately, though, and I'm giving myself the five minutes before I need to dash out the door to school to share them with you all. Let me start with World Without Fish and I'm not a Plastic Bag. Both are books I read to get some background for teaching a ocean pollution unit at the end of the month and WOW. They are amazing and a must read. I think I will purchase World Without Fish in multiple copies because it would be terrific for some kids to partner up and study. Lumberjanes Volume 3 and Alamo All-Stars were terrific additions to two graphic novel series that my students love. And Peddles and A Hungry Lion were two I read in the bookstore and enjoyed. If I was staying in elementary school next year, A Hungry Lion would be on my must purchase list. Reminds me a lot of I Want My Hat Back, but in a different way. Super fun. Have you ever had the experience in the classroom that something occurred and it was almost as if you planned it, it was that perfect, but you actually hadn't? Yep, that was my day yesterday. 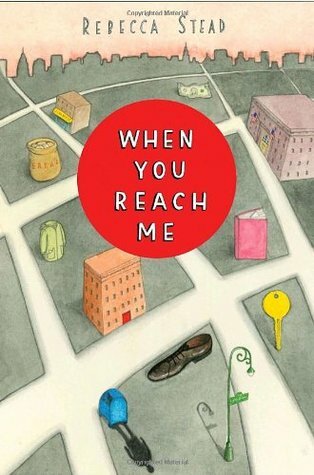 See, our current read aloud is When You Reach Me by Rebecca Stead. Man alive, is this amazing. I'd read it before, way back when it came out, but I've never read it to a class. My friend had told me that it was one of her all time favorites to read aloud. So, when looking for a book to read after spring break, I grabbed it. I think it was meant to be read aloud. It is the perfect book. There are short chapters, great description, edge of your seat moments. I'm loving it. In nine days we've read almost the entire book - just 10 pages left to read on Monday. Brilliant. But the key moment came yesterday and I hadn't even planned it. I was reading along, in the moment with the kids, when I came upon this paragraph below. Miranda is at an assembly with her class and she decides to do a kind thing to a fellow classmate. You could say her eyes have been opened, in a way. 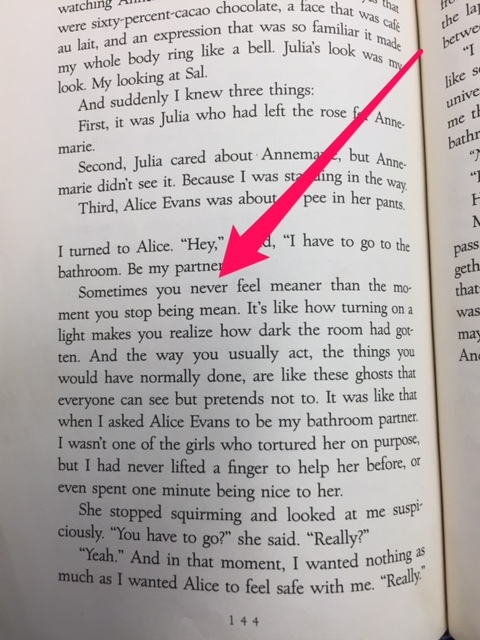 I read the line, "Sometimes you never feel meaner than the moment you stop being mean." and I almost gasped a bit out loud. See, we'd had some issues with "meanness" this week - intentional and unintentional. I love my class, each and every one of them. They are good kids. Some are still figuring out the path they want to take, trying out different personas on for size. That's pretty normal in fifth grade. Heck, I know adults like that. At any rate, we had some bad choices this week. I had lots of character building conversations which, if I'm being honest, are exhausting and heart wrenching at times. And so, at 1:20 yesterday I sat in front of my beautiful kids and read. I hit this line and gasped a bit at the beauty and honesty of it. I looked up and locked eyes with one of the kids I'd spoken to that day. He gave me a slight nod. My eyes watered, I looked back down. Pausing, I said to the class that I thought I should reread that line, that these words were honest and true and I wanted everyone to let them soak in and realize what Miranda is saying. Sometimes you never feel meaner than the moment you stop being mean. We sat there with those words around us like a blanket. 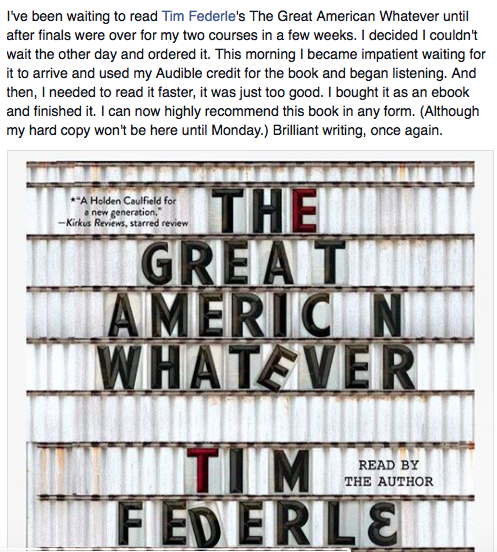 I think many of my students probably just smiled, wondering when I would read on, which I did in just a few seconds. Probably grinning at my eyes welling up, again, and wondered if I cry at every single book I read. Some students didn't know why that line caught me the way it did. But several did. They knew. They had been in those conversations with me that morning. They knew they had a choice to make. That I believe in them, but they needed to believe in themselves. And then along comes our read aloud and smacks us all in the face with the perfect line. The perfect character who is a good person, but had been unkind without intentionally meaning to. Who made the right choice. Man, I have to thank the universe for that one. You never know what lesson a read aloud will teach you. I can read the same book to different classes and get different reactions depending on the kids in class and the background we have. I love the connections we build through the books we share. They bring us closer together and give us a common language. And When You Reach Me by Rebecca Stead? I cannot recommend it highly enough. My friend was right, it's a brilliant story to share.